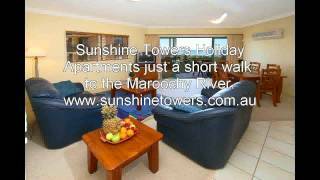 Sunshine Towers Boutique Apartments are ideally situated in the heart of Queensland's magnificent Sunshine Coast where you'll discover Maroochydore and Cotton Tree by the river, the best holiday getaway for families, groups and couples located just steps away from the fabulous Maroochydore Surf Beach. With only two apartments on each of their five levels, Sunshine Towers spacious apartments take in lovely ocean and river views from the large balcony of your fully self-contained air-conditioned two or three bedroom apartment, with all self contained facilities. Swimming, fishing and surfing are only a few minutes walk to the Maroochydore Patrolled Surf Beach. Simply relax and enjoy your next holiday. The apartments are close to everything, 150 metres from the Maroochy Surf Club, across the road from the Bowls Club and library, less than 50 metres to the Cotton Tree Shopping Village, within walking distance to the RSL Club or catch the free bus. Shop till you drop - retail therapy in every direction, so take your pick! Amazing ocean and river views from this spacious two bedroom ensuite apartment with two balconies, two air-conditioners, full kitchen, leather lounges, separate bathroom with corner bath, also includes secure undercover car parking. Easy walk to shops and restaurants. Beautifully designed and spacious three bedroom spa air conditioned fully self contained apartment,large balcony with views overlooking the heated pool and tropical gardens, two car secure parking. Lift access to all levels. Enjoy your holiday with two patios, ensuite, air conditioned, ceiling fans, television to Master Bedroom, Austar connected to both, Secure Car Parking, Lift to all levels, fully-equipped kitchen with lovely ocean and river views. Broadband Internet available. Modern spacious fully self contained apartment, two person spa bath, ensuite, air conditioned, ceiling fans, television in lounge and master bedroom with Austar. Beautiful ocean views from the large north/easterly facing sunny balcony. Two car secure parking and lift access to all levels. 150 metres to the beach shops and restaurants.